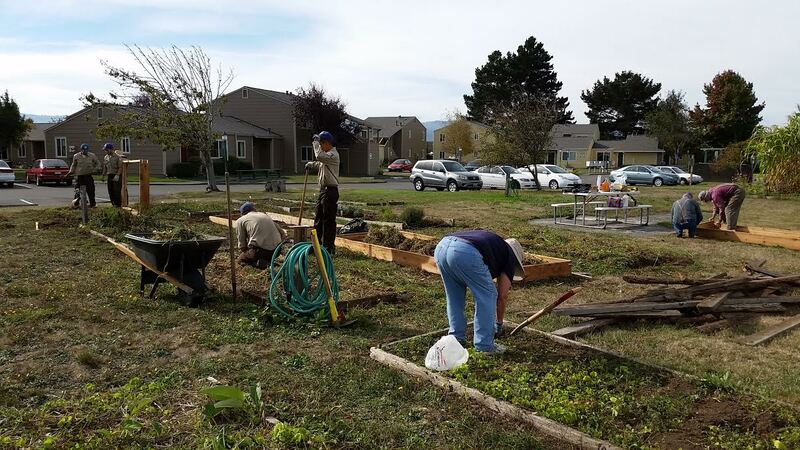 Numerous community volunteers including members of the garden and the California Conservation Corps came out last month on a sunny Saturday to replace eight wooden raised beds at the Fortuna Community Garden. Lumber was donated by North Coast Community Garden Collaborative. Volunteers shared a lunch together afterwards. For more information about the garden, please contact Pamela at (707) 725-2995. If you are looking for space to garden, there are community gardens welcoming more participants. Contact information for many local gardens is available on the Local Garden page of www.northcoastgardens.org, or please call (707) 269-2071. On Wednesday November 18 the Humboldt Food Policy Council is hosting a talk on "Food Deserts," or areas where residents have difficulty accessing enough food, from 5:30 - 7 p.m. at the Community Wellness Center on 7th and J Streets in Eureka ( 908 7th Street). The talk will focus on how the concept of food "deserts" applies to our rural community and ways residents are addressing food deserts. North Coast Community Garden Collaborative will present about community gardens as one community-identified solution to increasing access to food including foods that are nutritious, fresh, and culturally appropriate, or acceptable to one's culinary tradtions and background. Deborah Giraud, Farm and Community Development Advisor for University of California Cooperative Extension (UCCE) and Steering Committee member and founding member of North Coast Community Garden Collaborative, will discuss UCCE's work with local tribes around growing, procuring, preparing, and preserving fresh and culturally acceptable foods. Laura McEwen, Public Health Nutritionist in the Healthy Communities Division of Humboldt County Department of Health and Human Services, will discuss progress of the Food Desert Subcommittee of the Humboldt Food Policy Council. The Food Desert Subcommittee is examining food deserts in Humboldt County and discussing local and sustainable solutions. Christine Fry with ChangeLab Solutions, a Bay-area non-profit which makes healthier choices easier and promotes community-based solutions for America's most common and preventable diseases like cancer, heart disease, diabetes, obesity, and asthma - will present via teleconference about ways other communities are addressing food deserts. An article in the Times Standard newspaper raises awarenss about the issue and talk. We hope you can join us for an informative evening of "food for thought." From November 1 through December 31 please support Food for People's "Holiday Spirit Food and Fund Drive" to provide food to community members in need this holiday season. Please drop off your non-perishable food items (no glass jars, please) at one of 40 drop-off locations around the County. Food for People is Humboldt County's designated food bank and has pantry sites throughout the County. To find the location nearest you, visit www.foodforpeople.org or call (707) 445-3166. Healthy, protein-rich foods are always our greatest need. Your contribution provides much needed food, and hope, for individuals and families struggling to make ends meet. Thank you for your participation. 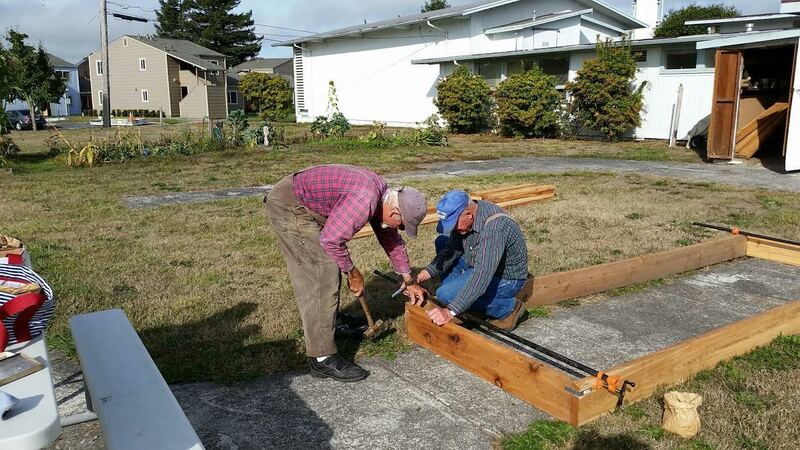 Community members, including gardeners and volunteers, replaced wooden raised beds at Fortuna Community Garden at a garden workday last month. - Senior Thanksgiving Dinner: Wednesday November 18 at 12 p.m. at the Christ Lutheran Church in Fortuna (2132 Smith Lane at Christ Lutheran Church). Join us for a special holiday meal with traditional Thanksgiving fixings. $3.50 suggested donation /$6 for those under 60. No senior will be denied a meal if unable to donate. For more information contact (707) 725-2995. - Food Deserts Presentation: Wednesday November 18 from 5:30 to 7 p.m. at the Community Wellness Building in Eureka (908 7th Street). Members of the Humboldt Food Policy Council will present on food “deserts” – or areas where it’s difficult for residents to access foods-- and creative solutions of community members. More information is available in the opposite column. For more information contact barbara.browning@humboldt.edu. - Last Garberville Farmers' Market: Friday November 20 from 11 a.m. to 3 p.m. in the Garberville Town Square (Church and Locust Streets). Come visit for fresh vegetables, fruit, nursery plants, eggs, grass fed beef, Pork, Lamb, pastured poultry, baked goods, nursery plants and starts, Oysters, Live music on the Square, crafts and more. For more information contact sohumfm@yahoo.com or (707) 923-3499. - Last Arcata Plaza Farmers' Market: Saturday November 21 from 9 a.m. to 2 p.m. at the Arcata Plaza (H and 9th Streets). Fresh vegetables and fruits from local producers, food vendors, plant starts and flowers and more. For more information visit humfarm.org. - Senior Thanksgiving Dinner: Saturday November 21 at 11:30 a.m. at the Humboldt Senior Resource Center in Eureka (1190 California Street). Join us for a special holiday meal that includes traditional Thanksgiving fixings. Bob Ebenstein will be playing the piano from 11:00 till noon. The celebration will include a handmade afghan door prize, delicious food and decorations. $3.50 donation for seniors/$6 for those under 60. No senior will be denied a meal if unable to donate. - Mushroom Fair: Sunday November 22 from 11 a.m. to 4 p.m. at Redwood Acres Fairgrounds (Home Ec Building) at 3750 Harris Street in Eureka. View a large display of mushrooms and learn about edible and toxic mushrooms. $3 for adults, $1 for kids age 10-16 and kids under 10 are free. For more information visit redwoodacres.com or contact (707) 445-3037. - PLANTSGiving Vegan Potluck: Sunday November 22 from 2 to 4 p.m. at the Humboldt Area Foundation in Bayside (363 Indianola Road). Please bring a vegan (no animal products, including meat, fish, dairy, eggs, honey or gelatin) dish to share, as well as your own plates, cups and utensils. Donations are appreciated. For more information contact vegansocietyhumboldt@yahoo.com or (707) 832-8907. - Eureka Rescue Mission Thanksgiving Dinner: Wednesday November 25 from noon to 4 p.m. at the Eureka Rescue Mission (110 Second Street in Eureka). A traditional Thanksgiving meal will be served with live music and fun. All are welcome. For more information contact cjoffice@eurekarescuemission.org or (707) 445-3787. 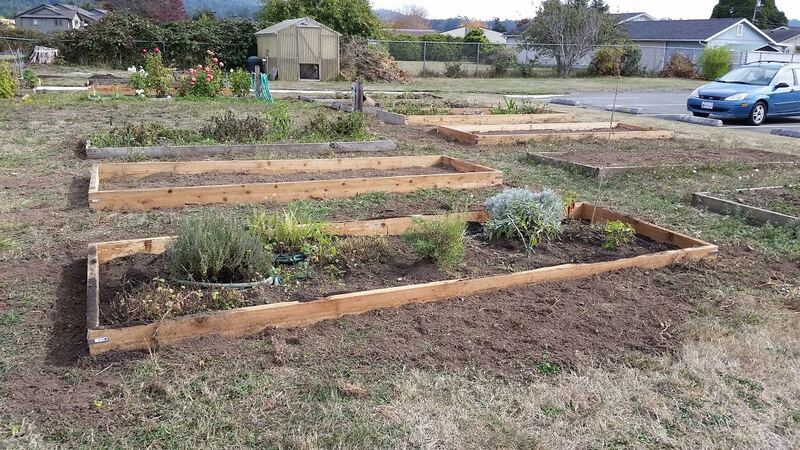 - Community Garden Clean Up Day: Saturday December 5 in Arcata. HSU students are organizing volunteers to assist local gardens with a "clean up" day. For more information please contact Jasmine at (925) 690-7487 or jln282@humboldt.edu or Karen at (323) 919-7514 or km2819@humboldt.edu. - Linguica and Beans Dinner: Sunday December 6 from 5 to 8 p.m. at the Portuguese Hall in Ferndale (Fifth Street and Ocean Ave). Food and friendliness on tree lighting night. For more information contact (707) 786-4222. Gardening Gazette is a free publication of North Coast Community Garden Collaborative, a support network of and for local community gardeners. Learn more at www.northcoastgardens.org or "North Coast Community Garden Collaborative" on Facebook. Copyright (C) 2015 North Coast Community Garden Collaborative All rights reserved.